The 23rd-ranked Wolfpack score their fewest points in the shot-clock era. RALEIGH, N.C. — No. 23 North Carolina State was held to a stunningly low point total, beaten by No. 12 Virginia Tech 47-24 on Saturday in the Wolfpack’s lowest-scoring output of the shot-clock era. Kerry Blackshear had 13 points and 13 rebounds, and Nickeil Alexander-Walker added 11 points for the Hokies (18-3, 7-2 Atlantic Coast), who led the entire way despite playing without point guard Justin Robinson. N.C. State (16-6, 4-5) made just 9 of 54 shots, a conversion rate of 16.7 percent that included a 2-for-28 showing from 3-point range. It was N.C. State’s lowest scoring output since getting 12 points in a win against Duke in the 1968 ACC tournament, nearly two decades before the implementation of the shot clock. 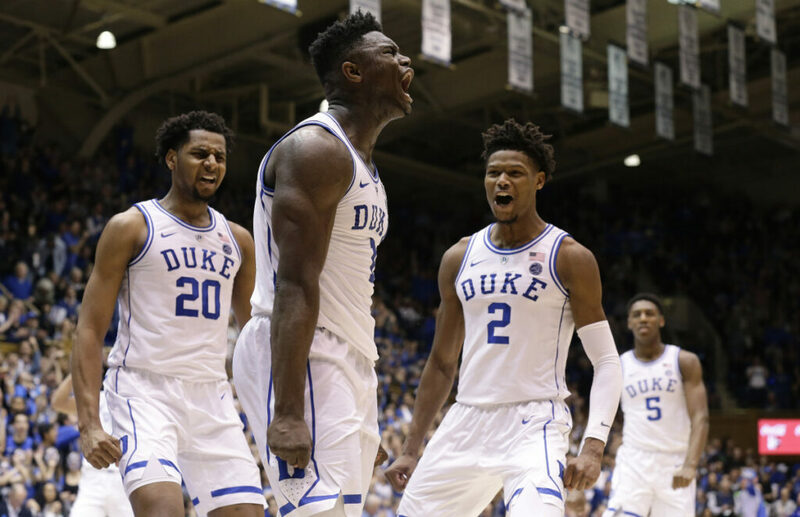 (2) DUKE 91, ST. JOHN’S 61: Zion Williamson scored 29 points and the Blue Devils (19-2) routed the Red Storm (16-6) in Durham, North Carolina. (3) VIRGINIA 56, MIAMI 46: De’Andre Hunter scored 14 points, Mamadi Diakite had 11 points and three blocks, and the Cavaliers (20-1, 8-1 Atlantic Coast Conference) sent the visiting Hurricanes (9-12, 1-8) to their fifth straight loss. (7) KENTUCKY 65, FLORIDA 54: Tyler Herro scored 19 points, and the Wildcats (18-3, 7-1 SEC) rallied from an 11-point deficit to beat the Gators (12-9, 4-4) in Gainesville, Florida. (9) NORTH CAROLINA 79, (15) LOUISVILLE 69: Luke Maye had 20 points and 11 rebounds, Cameron Johnson finished with 19 points and 10 rebounds, and the Tar Heels (17-4, 7-1 Atlantic Coast Conference) won at Louisville (16-6, 7-2), avenging a blowout loss earlier this season. (11) KANSAS 79, (16) TEXAS TECH 63: Dedric Lawson had 25 points and 10 rebounds, and the Jayhawks (17-5, 6-3 Big 12) snapped a two-game losing streak with a win over the Red Raiders (17-5, 5-4) in Lawrence, Kansas. (20) IOWA STATE 65, TEXAS 60: Talen Horton-Tucker scored 15 points, Marial Shayok had 12 and the Cyclones (17-5, 6-3 Big 12) held off the Longhorns (12-10, 4-5) in Ames, Iowa. (1) BAYLOR 96, TEXAS TECH 37: Kalani Brown dominated inside with 23 points on nine layups – five of which became three-point plays – and the Bears (19-1, 9-0 Big 12) routed the Raiders (10-11, 1-9) in Waco, Texas, for their 32nd consecutive conference win. (2) UCONN 65, CINCINNATI 55: Napheesa Collier scored 20 points to reach 2,000 in her career, and the Huskies (19-2, 8-0 American Athletic) held off the Bearcats (14-8, 6-3) in Cincinnati. (3) LOUISVILLE 76, CLEMSON 44: Jazmine Jones tied her career high with 17 points and the visiting Cardinals (21-1, 8-1 Atlantic Coast) followed up their victory over No. 2 UConn with a rout over Clemson (14-8, 5-4).